I’ve been married to my lovely husband for nearly 10 years and we have two young boys. After our boys came along our dates went out the window. Partially due to time and energy but also due to money. I decided it was time to start implementing date nights again so went in search of date night ideas. For Christmas last year I gave my husband 12 dates! They were packaged in little envelopes with cards showing what the date was. Each month he opens one and we go on a date. Most of my date night ideas are easy and cheap as we are on one income and our budget is tight. Below I have shared some of my date night ideas for you to enjoy with your spouse. My husband and I used to go on picnics often when we were dating. Somewhere along the line we stopped and I decided it was time to reinvent this date. Pack a picnic, a rug, some blankets and pillows and go on a moonlit picnic. We live near the beach so often go there but you could find a nice park or a private reserve and have a picnic under the stars. This is one that you can do at home. Melt some chocolate, cut up some fruit and marshmallows and sit down to a candlelit chocolate fondue night. Can’t get night time babysitters? What about brunch? Maybe it is the ability to eat your whole breakfast without sharing or finishing your coffee while it is still hot, but there is something special about a mid morning outing to a cafe with no children. Grab an ice-cream and take a wander around your local beach, parkland, lake or national park. Getting some fresh air, enjoying nature and having some one on one time is a great, quick, cheap date. Yum Cha is fun and we’ve enjoyed some lovely date nights at the local yum cha restaurant! This one isn’t exactly a cheap outing but it is fun and kind of indulgent. Find a cinema that offers those reclining seats and in seat food and wine service and make a night of it. This is a great gift idea as well if family ask what you’d like for Christmas or a birthday! Well this is kind of a date day activity but it is fun and cheap. You might be tempted to bring the kids along but perhaps do a test run on your own first. You can stop by a local cafe for a coffee on the way home too. Find a local cafe or tea house that does high tea (the David Jones at Macquarie Centre in Sydney does a great, cheap one if you are near by!) High tea is a little bit sophisticated and a nice little treat for a day time date. Yes, a date at the circus. No kids. Buy fairy floss, play the laughing clowns and act like a kid again! You know those chocolate cafes that sell indulgent waffles, churrios and chocolate strawberries? Find one. Eat there. Thank me later! What characteristic do you most hope your kids grow up to have and why? Design your perfect dinner party: guests, food, location etc. Go to a few garage sales with the purpose of finding a special gift for your spouse. Browse together, watch what they look at and buy something you think they will love. Hide it and wrap it up at home and then exchange gifts. Was there somewhere you always went when you were first dating? Something you always did? Revisit it! Do it again. 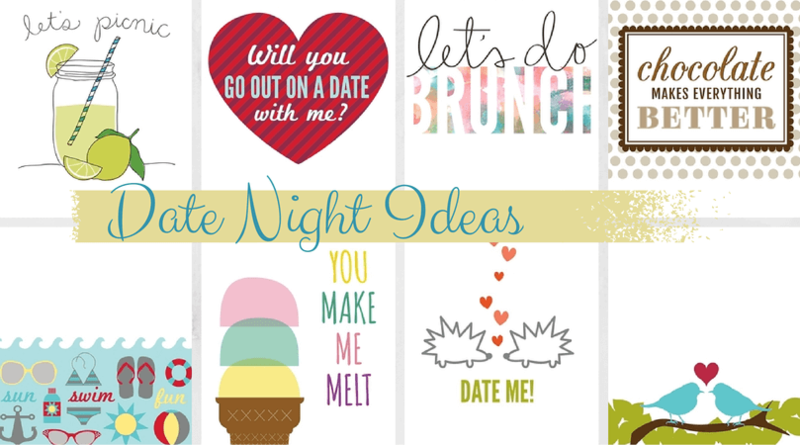 Want some FREE date night printables? Check out my free stuff here. What other date night ideas do you have?